As a Parent, See How To Guide Your Children! - You Are A Genius You Are A Genius: As a Parent, See How To Guide Your Children! As a Parent, See How To Guide Your Children! You must have to know the meaning of parental guidance first, which is the most important aspect in every family and in the midst of every family. parent s are expected to teach and make the children know what parent all guidance means. let me give you a dictionary definition of parental guidance before I go into illustrations and explanations. Parental guidance is simply The presence of a parent or an adult within earshot of a conversation that a teen is having with another teen with a topic they don't want the adults to know about. When you as a parent listens carefully especially hidden when your children are having discussions privately with their classmates or age mates, you are expected to keep calm and hear what they're saying. You must tell your children to be selective of the friends they make. After their normal discussion and they depart to their various homes, you will have to call your children close to you and give them a fatherly and motherly advice until when due. though it's never gonna stop them if they don't have a listening ear to their parents. When every parent in the world we dwell in today know what parental guidance means, then the negative actions and attitudes of our children these days will be reduced to more positive actions and responsibilities. In order words, When are talking about the meaning of parental guidance every home is included, no matter how poor that home is, we are expecting every home to be manipulated by many much more positive actions in the lives of their children. The more reason why we are emphasizing more on parental guidance today is that she has noticed a lot of things happening in the lives of our kids especially when they're in the school. We are bringing it as a notice to every home today including the fathers and mothers to go closer to their children. Of a truth, we are giving a million thumbs up to our mothers who are doing very great and marvelous works in the lives of our children. We are also advising some of our fathers who think that parental guidance is only meant for the mothers to as well look into the lives of the children too. Most children are more fearing for their father more than the way they are to their mother. The reason is that the mothers are more playful to them and even more encouraging to them too, that is why we are also bringing it to notice to all our fathers all over the world to look into the guidance lives of their family as the head of the family. 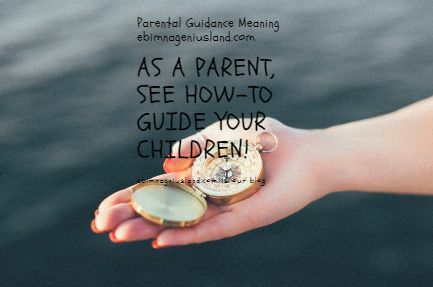 There are several meanings of parental guidance, therefore let every home be mindful of the kind of guidance they give to every child in existence no matter how small, you just have to be there for them. So many parents don't even look into the affairs of their children, which is very wrong of them, and we are seeing it as a part of the failure to their homes. We are to encourage ourselves not waiting for anyone to encourage us for any reason because those people we are waiting for them to encourage us are also looking for who to encourage them too. When their several things we are to do and we don't do them, it is simply in records that we nothing but failures. therefore if you don't want to be recorded amount the failed people in your generation, you must have to do what is right, for what is worth it.